In the post What’s Meal Planning, we have already seen what Meal Plan means and what its benefits are. In this post, I have created a complete step-by-step guide to plan a weekly menu, even if you are a very busy woman and don’t consider yourself an expert in the kitchen. Also, with a few more tips, we’ll see how to make sure that our weekly menu is also healthy. 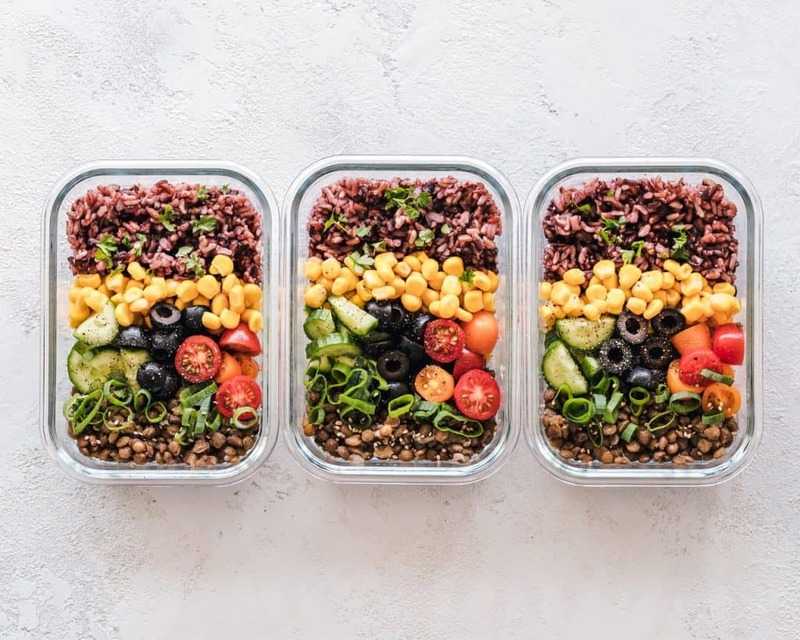 Depending on your schedule, it’s important that you choose one or two days throughout the week when you can devote some time to prepare your meals. You could spend a whole day planning the menu, buying groceries and preparing the food, but another option is to do it on separate days. – Friday: you can decide what dishes to make and get the grocery list ready. – Saturday: you can go grocery shopping for the entire week. – Sunday: you do all of the prepping you can. For example, cut salads, bake vegetables, boil a cereal, prepare a sauce, etc. Once you have everything organized and ready in the kitchen, preparing your daily meals will be very easy. If you prefer, you can organize yourself to get all of the dishes ready in advance, or you can choose to cook twice; for example, Sunday and Wednesday. It’s important that, before doing your Meal Plan, you have a look at your activities/work calendar. If you know ahead of time that you are going to have a busy day and you won’t have the time to prepare any food, then organize yourself so that you get your meal ready on the previous day. Also, make sure not to choose to prepare an elaborate dish on a day when you are particularly busy. Finally, meal planning doesn’t mean that you have to stop your social life. So, when you are choosing your meals for the week, keep in mind those days when you are going to eat out. Prepare a list of your favorite recipes that you know by heart. This will be your reference list to use when choosing the meals for the week. Make sure, in addition, to update this list every time you try a new recipe, and if you loved it, you will want to make it again. Ideally, divide this list according to the recipe’s main ingredient, especially if it has some protein. In the next point, we’ll see why this is important. Before adding the meals to your meal plan template, decide what type of protein to prepare in advance. For example, one or two times a week you will use chicken, fish two times, tofu once, eggs two times, and etc. If you don’t mind repeating meals during the week, you can prepare big quantities of the same recipe, even for three meals that can be eaten for two or three days. Make sure, at the same time, that with the other meals you balance the ingredients and nutrients that you will eat. If you prepare a dish because you were told that it’s healthy, but you don’t really like the taste, my advice is do not add it to your meal plan. Keep in mind that enjoying your meals helps you feel satiated and satisfied. It also helps you to avoid the cravings of junk food shortly after your meals. If you usually don’t have a lot of time, always choose easy and simple recipes. For example, boil a cereal and a legume of your choice and bake a few vegetables. Another option is to only plan your dinners and cook double the amount so that you have your lunch ready for the next day. If you make simple preparations, such as baked vegetables, you can use different herbs and spices each time to vary the flavors. Another option is to prepare sauces and fridge staples to accompany these preparations; for example, this caper hummus or this mojo picón. To keep your preparations fresh longer, it’s important that you store them properly. Use airtight glass containers that can also be used in the microwave or in the oven. This will also help you to use less dishes, thus saving time in washing them. For convenience, you can store some foods in plastic Ziplock bags, especially for snacks you want to take on the go. If you cut raw vegetables in advance, consume them as soon as possible and, to reduce the oxidation process of the food, avoid having too much air in your containers. As you consume more of the food, transfer the amount left into a smaller Tupperware container. If you have never done meal planning before, it can be a bit overwhelming to have to think about every detail for the whole week. Starting slowly is a good option to avoid getting overwhelmed. For example, for the first week, you can organize just your breakfast. For the week after, you can add the snacks, and so on, until you slowly become the queen of meal planning. After you have done meal planning for about four or five weeks, you can start repeating them. For this reason, using a template can be very useful, especially if it’s a template where you can include both the dishes that will be prepared during the week and the list of ingredients that are needed. Below we talk more about the templates and, in addition, downloading one for free. Now that we have seen how to plan a meal, let’s see what the best practices are to make sure that our meal planning is also healthy. Remember that animal protein should be a quarter of the entire amount of food on your plate, making sure that it’s of good quality, avoiding processed products. Each food has different compositions and nutrient amounts needed to meet our daily needs. With this in mind, it’s important to maintain a varied diet and to keep changing the food we eat. It’s possible that you always have the habit of buying the same ingredients because you know that you like them and know how to prepare them. 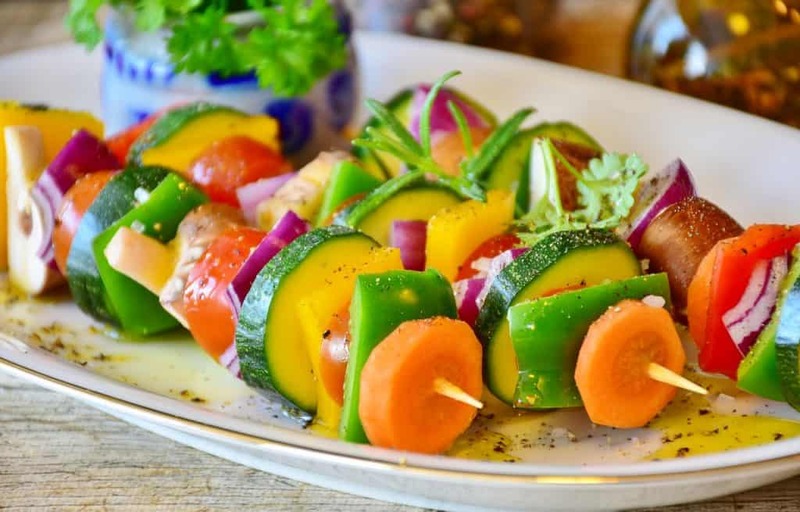 But it would be enough that you exchange some ingredients from your weekly menu every week; for example, you can buy other types of vegetables and fruits, as well as change the protein and the whole grain that you are going to eat. The seasonal ingredients are a guarantee of consuming local products, possibly ripened on the plant, that go right to your plate. Even if you have your favorite recipes, give yourself the freedom to play with the ingredients, focusing on the seasonal ones. In addition, seasonal products tend to be less expensive (or, at least, they should be…). This is closely related to what we have just said about the varied diet, but it goes even further to say that it’s related to trying the unknown. You don’t need to buy the trendy ingredients or the latest superfood, but just look at what choices you have when you buy groceries. If you see a type of vegetable that you have never bought, write down its name and look for some recipes online about preparing it. You could even ask for advice at the grocery store. Another advantage of introducing new foods is that you can experiment in the kitchen and maybe, you will find new recipes that can be added to your list of favorites so you never run out of ideas for your meal plan. For those days, having frozen meals ready to eat can help maintain your healthy eating habits. 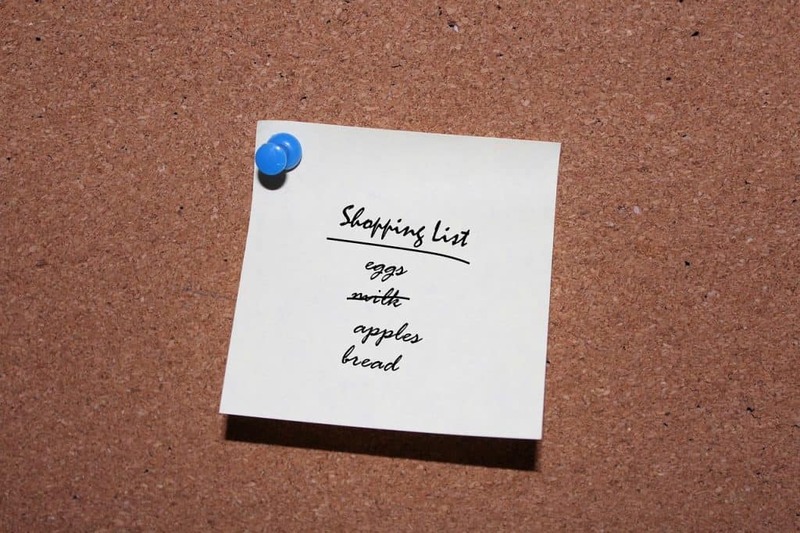 To make meal planning even easier, here are a few tips to quickly prepare a grocery list and to organize it so that the visit at the supermarket is quick and painless. In your list of favorite recipes to use as a reference when meal planning, add the list of ingredients needed to prepare each recipe. I recommend making the list of ingredients with the quantities needed for one person. This way, if you have to prepare food for more people, you simply have to increase the quantities. This may seem an exaggeration, but if the list of ingredients appears in alphabetical order, it will be even easier to compile a shopping list because it will all be more visual. Another small tip that can save time when physically buying groceries is to have the list divided by types of ingredients; for example, all of the vegetables together, all the fruits together, etc. If you need to visit different stores to buy your groceries, the ideal is that there’s a list for each store; for example, one for the fruits and veggies store, one for the butcher, etc. If you are short of time or don’t like to go to the supermarket, it’s very likely that there is an option to buy your groceries online and to receive it comfortably at home. If you are in the US you can buy quality and organic ingredients at a reduced price on Thrive. It’s very likely that you have seen some meal planning templates before. If you do a quick search on the internet, you will find many that can be downloaded for free. In this particular one, I’ve decided to include a shopping list on the same sheet to make everything more visual. 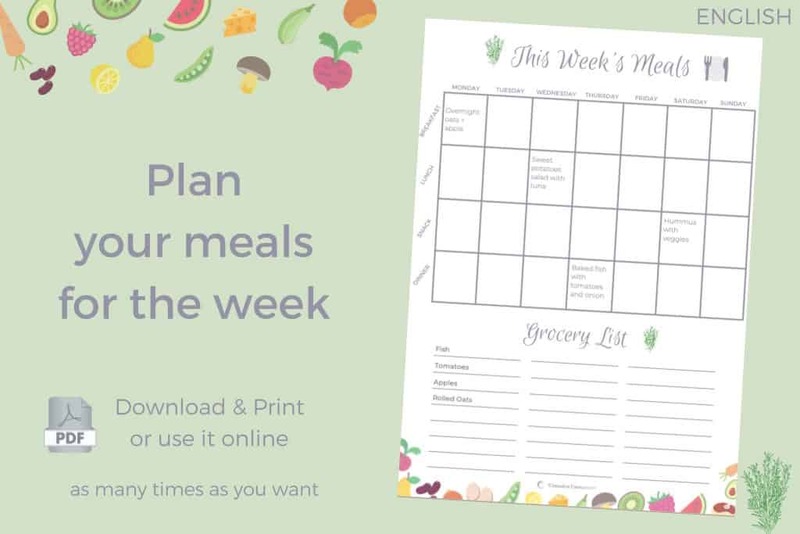 Once the week is over, don’t throw the sheet away, but take a look at it while meal planning for the following week so that repeating dishes can be avoided, allowing you to maintain a varied diet. The advantage of this meal planning template is that it can be printed or used online, allowing changes to be made as many times as you want. If you prefer to print it, I suggest using a pencil to write down the list of ingredients, especially the quantities; this way, they can be modified when you recycle the same template. As you can see, in this template, there is only one snack planned per day, but if two snacks are needed per day, you can use the same box for both. Finally, along with this meal planning template, there is a habit tracker that can be used to confirm that you are eating healthy, transforming this new habit into a lifestyle. If you are more of a tech person and like to use applications to organize everything, be assured that there are a few of them that are very helpful for planning the weekly menus. Some time ago, I discovered Real Plans. 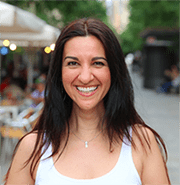 What I find most interesting about this app is that you can choose the type of diet, vegetarian, gluten-free, dairy-free, paleo and a few more. In addition, the app includes more than 1600 recipes that can be saved or delete the recipes you prefer or even add your own. But, best of all, it generates the shopping list automatically. And if you are in the US, with a single click, it allows you to buy your groceries online. Its price is $14/month, but if you buy the annual plan, it’ll only be $6/month. Now, regardless of how you like to get things done, keep in mind that it may be difficult to organize everything for your meal plan at first. In fact, I wouldn’t be surprised at all, since preparing a weekly menu is not such an automatic process. However, once you have gotten the hang of it and have automated parts of the whole process, it will make everything faster. I’m also sure that after a few weeks, you can even stop planning your menus because they already exist.